Our Android MapTrack app has been used during a trip around the US for six months now. MapTrack is an Android app for recording and sharing tracks in real time. 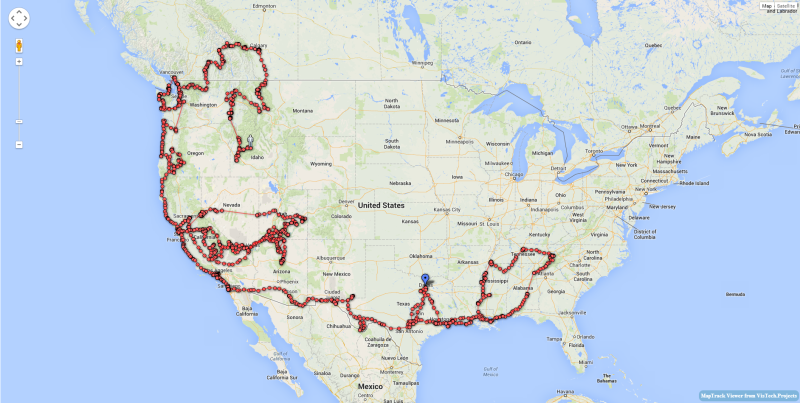 One of MapTrack users (Brian) has been using it during his trip around the US for last 6 months. He has embedded Track Viewer from the app into his blog. If you are interested in tracking and measurements on maps please check also our Planimeter app. Laser Distance Meter - camera measure. Measure distances with camera on Android phone or tablet. LaserDistanceMeter is a camera measure tool for quick estimation of distances and length. You can use any reference object with known size for measurements. Laser Distance Meter has also automatic mode where you can make a measurement with only one click! Any android camera device, phone or tablet, can be used for measurements. Just follow the procedure to calibrate your device and you are ready to measure distances to any object with your camera. Using standard objects like a car, window, golf flag, human height, etc. as a reference you can measure distances - just select Custom option and enter the object size. LaserDistanceMeter has a list of commonly used reference objects like credit card, Letter or A4 sheet, coins, DVD disk, etc. The App shows measurement results in different units: meters, millimeters, centimeters, feet, inches based on user settings. There is an option to make a picture or load a picture from gallery, Zoom View feature helps to align object boundaries accurately. - quick calibration with predefined standard objects. This app can be useful for outdoor and sport activities: golf, hiking, traveling, etc., where quick estimation of distances is needed. It also can be used for measurements in a room or small objects measurements. Using Custom option you can make measurements in wide range depending on a reference size: from mm to km, from inches to miles.